Massachusetts hockey rising sophomore John Leonard was drafted 182nd overall by the San Jose Sharks in the 2018 NHL Draft on Saturday afternoon. Leonard joins fellow Minuteman Mario Ferraro as draftees of the Sharks as Ferraro was selected 49th overall in the 2017 NHL Draft by San Jose. Born and raised in Amherst, Leonard led UMass in scoring as a freshman last season with 28 points in 33 games played. Leonard’s 13 goals tied with Mitchell Chaffee for most on the team and tied for second all-time for goals by a freshman in the Hockey East era. 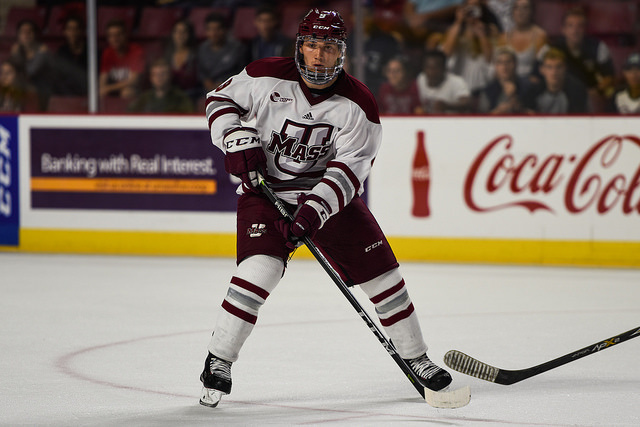 With his selection, Leonard becomes the first Minuteman to be chosen in the NHL Draft following his freshman season since Justin Braun was a seventh-round pick of the Sharks in 2007. In 2017-18 Leonard took home Hockey East Rookie of the Month, Player of the Week, and Rookie of the Week (twice) honors to round out a special freshman season for No. 9.